Bosch T123X Jigsaw blades are the best steel cutting blades i have ever used. Looking at your photos surely you have ample room for a shower, basin and toilet, without going over your porthole. Could you show us a drawing with measurements of the space you are struggling with? My mooring is opposite, I'll watch out for you. 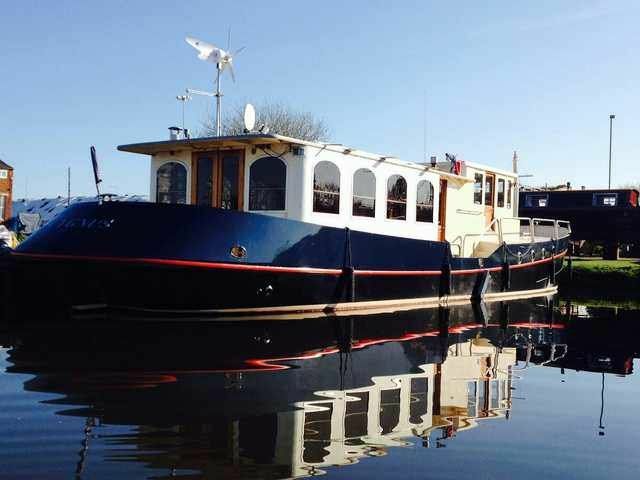 Brodsworth is moored on the canal at Viking Marina. C. Campling (Goole) Ltd, is now Viking Marine (Goole) Ltd.
Would this be yours ? First two pictures of Exol Pride in the New Junction, the third of Pride penning out of Ocean Lock (Goole) onto the River Ouse. I would be concerned if the oil pressure with SAE30 was too low at idle but as it is in the high 30s I'm not. It goes up into the 40s with increased rpm so no worries on my part. With multigrade oil the pressure is pretty constant at any revs. When doing oil changes in the future I may alternate between 30 grade and multigrade. Sort of using 30 grade as a flushing oil. What do you think? Do you think a folding shelf bracket might do the trick? They come in all sorts of sizes and strengths. The red topped filter is the crank case breather. I've just done a service on my 120hp 6LW and I got about 20.litres out. Replaced with SAE 30 oil. The PRM hydraulic gearbox however got 15-40 oil. In the past i have used multigrade oil and noticed that the oil pressure stays pretty constant whatever the engine RPM, however when I use SAE 30 the oil pressure gauge fluctuates more with differing engine speeds. What boat builder for manufacture of a custom designed shell? I think that sailaways.net would be the last place you should consider Phil. They seem to specialise in fairly mundane, off the peg shells, not one-offs like you seem to want. The very boat builders you seem to be writing off are the ones who are the most likely to be able to accommodate you. After all we are only talking about a very small canal boat. I must admit I don't often read right through the threads on this forum but I have on this topic, it's been interesting. With respect Phil i think it is obvious to most that you have no experience of boat builders or even canal boat builders. Visit a few and maybe you might appreciate what others have already said. Most reputable canal boat builders have been around for many many years, a fair number since leaving school and now in their 60s or even 70s. I can think of some that have probably built thousands of shells. Tim Tyler and Jonathan Wilson spring to mind. My own "custom built" boat was designed by a Naval Architect and built by a 65year old, a 70 year old, and a "lad" of 40ish. Between them they probably had over a 120 years of boatbuilding experience. Whoever you approach for your boat build, please treat them with respect or you will not be received well. I know some of the comments made on here might grate a little but there is some good advice also. CAD may well make an appearance in canal boatbuilding but I wouldn't hold my breath. Good luck with your project. Whereabouts are you based gnasher?